For this fifth Underworld movie director Anna Foerster and script-wrangler Cory Goodman decide that continuity can go take a hike. It seems like the bits of the previous movies they liked the best were the parts involving high-powered vampire politics, since in this movie they go out of their way to include both an extensive modern vampire coven based out of a high-tech manor house like in the first movie and an ancient castle where the vampires basically dress like elves like in the prequel, with most of the action happening in one or the other of these locations. Of course, in Awakening we were told that the human authorities had found out about the existence of vampires and werewoofles and had instituted an almighty pogrom against both, and it’s made very clear in that that the vampires have suffered the worst of this – the woofles having entered a deal with the authorities whilst the vampires have been reduced to living in tiny remnants in forgotten places. There’s certainly no scope in that setting for the vampires to be operating out of a huge, fortified mansion in a major city like they do here, so Foerster and Goodman simply seem to have decided to ignore the whole collapse-of-the-Masquerade plot detail, which is not mentioned at all in the movie, not even in the opening narration. That opening narration extends into the opening action scene, which is so chopped up and edited that it feels like the edited highlights of a much longer sequence, just as the preceding footage constitutes the edited highlights of the earlier movies. The film’s plot is sufficiently messy and convoluted even in this final form that it feels like it’s gone through a range of different rewrites, never quite reaching the point where it worked the way it was intended to. 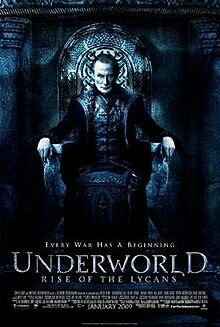 So I’ve covered the third and fourth Underworld movies here, but I never got around to reviewing the first two. Believe it or not there’s a fifth film being filmed in Prague this month and pencilled in for release about a year from now, and Len Wiseman talking about a sixth movie and a TV series in the pipeline, so I may as well take this mad October article marathon as a chance to catch up. Oh, you’re confused about the ultraviolet ammunition? Well, it’s ammunition filled with a fluid which has been irradiated with ultraviolet light, so the light dissolves in the fluid and destroys vampires when they’re shot with it as sure as if they were exposed to sunlight. Not a fluorescent liquid which emits UV light when it’s struck by X-rays or gamma rays or more extreme UV rays or something, just as most fluorescent liquids emit visible light when struck by ultraviolet light, mind – the dialogue in the movie makes it very clear it’s the former. Of course, the vampires who are examining the ammunition at the time are staring right at it whilst it’s supposedly emitting vampire-killing UV radiation, but sssh, quiet, just let it go. You’re going to have to deal with much greater leaps of logic if you’re going to sit through an Underworld movie to the end. When I went to see Underworld: Awakening with Dan and Kyra I made sure to manage my expectations accordingly. 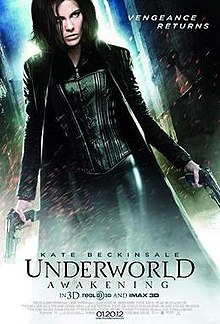 All the Underworld films are incredibly stupid, but the previous one was stupid in a way which threatened to cease being fun, degenerating into a dreary exercise of sleepwalking through backplot which everyone even mildly interested in the film already knew back to front. The problem they had, of course, was that with the first two movies they more or less ran out of plot, so a continuation of the series would need to find some way to disrupt the status quo reached by the end of Underworld: Evolution. This is adequately achieved in the first ten minutes of Awakening, in which we get a brief action-packed rundown of the first two films, then a tense action sequence to establish the new reality our protagonists are dealing with and depict the events which took them out of action, and then follows that up immediately with yet another action sequence in which our hero escapes captivity to find her world has changed utterly. If you’re thinking “wow, that’s a lot of action sequences”, you’d be correct: of all four Underworld movies, this one has by far the greatest emphasis on action and the least talky bits of any of them. There is no justification for placing the Underworld series in the horror genre, despite the abundance of vampires and werewolves, since none of the films ever really attempt to scare, spook, or instill a sense of dread in the viewer. As with the various World of Darkness roleplaying games that Underworld totally isn’t based on, it’s really best to regard the films as fun, gothy, mindless fantasy, with an appropriate emphasis on stylish violence and shapely female forms in unlikely costumes. This being the case, it was probably inevitable that the series would end up ripping off Peter Jackson’s take on The Lord of the Rings. 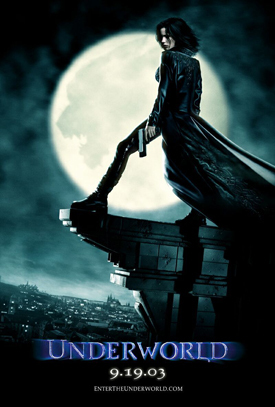 Underworld 3 (more properly Underworld: Rise of the Lycans) is set in the Dark Ages, a move certain to distance the series from the World of Darkness franchise. It covers the tragic romance between Lucian (Michael Sheen), the first Lycan (a werewolf able to transform between its human and wolf forms), and Sonja (Rhona Mitra), daughter of the vampire elder Viktor (Bill Nighy, chewing the scenery to pieces), and Lucian’s subsequent rebellion against Viktor and the liberation of the Lycans from vampire rule.